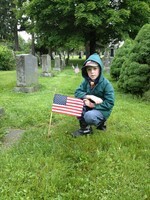 Cub Scout Kevin Hughes places a flag at St. Thomas Cemetery. On Saturday, May 25, 2013 Cub Scout pack 6 from Cornwall-on-Hudson joined the American Legion for the ceremonial placement of flags on veterans' graves at St. Thomas Cemetery. 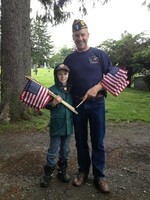 Cub Scout Kevin Hughes placed flags with Sergeant Major Vincent Mannion from American Legion post 353 of Cornwall.